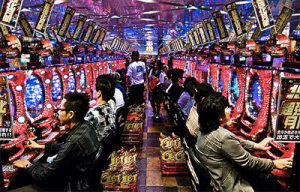 Widespread in Japan, Pachinko parlours are the country’s equivalent to the pokies clubs which exists in Australia, and so as you can imagine it’s a highly lucrative and popular past time for Japanese adults. No visit to Japan is complete without a visit to a Pachinko arcade. The uniquely Japanese arcade game is sometimes used just for recreational purposes but is widely known and played as a kind of pokies-pinball hybrid. Strangely, gambling is actually illegal in Japan. Pachinko machines reward players with metal ball tokens, which can then be exchanged for gifts. The value of these tokens varies from venue to venue, and may also depend on the type of game being played and the money (or tokens) wagered. Believe it or not, pachinko machines were actually created as a children’s toy called “The Corinth game”. Created in the 1920s, it took a number of years before it emerged as an adult pastime, perhaps once the generation that grew up playing it as children started using it as amusement in their older years. While most of the pachinko parlours were closed down during World War II, there was a renaissance of sorts in the late 1940s, which led to an industry boom and the first commercial parlour in Nagoya in 1948. Surprisingly, pachinko machines were mostly mechanical until deep into the late 1980s, requiring electricity only for lights, sounds and a few other aesthetic features. They functioned closer to pinball machines then, requiring the player to set the flipper speed and power to try and control where the metal ball tokens were placed. As the country went through a technological and financial boom in the late ’80s, so too did pachinko machines, and the game was essentially reinvented to become entirely electrical machines. These are the pachinko games we know today. While gambling is illegal throughout Japan, players can directly exchange their cash for little metal balls or tokens, which are then used as currency in the machines. The balls are then spun throughout the machine by pulling a leaver, a little like an old school slot machine still widespread throughout Las Vegas. Then, much like a pinball machine (except without the flippers and no direct control from the player), the balls bounce and spin throughout the machine, falling into different levers, cups and traps, or bouncing off springs and other obstacles. Think of it a bit like playing a pinball machine on steroids … while riding a unicorn and flying through space. Yes, it’s that crazy. Each pachinko game is different but the jist is the same: once a ball hits a certain point, more metal balls will be rewarded to the player. The more balls, the higher the chance of winning big. Some machines, particularly those made in the last 15-20 years, have an additional slot above the main playing area. This electrical screen plays similar to your standard pokies machine, and spins automatically as the balls bounce through the machine. The goal is to land three symbols in a row, which rewards the jackpot or may initiate a special game feature (the pachinko equivalent of free spins). Payout mode: If three symbols match on the reel, the machine will enter into a “payout” mode, which can last a few minutes. Generally this involves the player trying shoot balls into one of 3-5 slots which become available once the payout mode begins. If a ball lands in one of the slots, additional balls are rewarded. The payout mode varies from machine to machine, and some games even offer different modes (or what appear to be “difficulty” settings), which either increase or decrease your chances of winning as well as how much you win. Generally the lower the chance of winning, the more you can potentially win, whereas playing a “hidden” mode that guarantees a win generally won’t pay as much. This is where things get really strange. Pachinko arcades aren’t legally able to trade tokens for cash, but they function in a way as to allow players to almost directly walk away with a big cash prize. Generally what happens is a player calls for an attendant to come and remove their metal tokens from a machine. These tokens are counted, and the player is given a voucher to hand over at the parlour’s exchange centre. Here, the player can choose from a number of different prizes available to them based on their total number of tokens. Prizes vary from chocolate bars, to electronics, to “special prizes” normally consisting of gold or silver novelty items. Unsurprisingly, most players opt for the “special” prize, pending they have enough tokens to claim it. Once they have their prize, the player can then leave the parlour and trade it for cash at a nearby establishment, sometimes only a few doors down but often in the same building as the parlour itself. While Japanese law prohibits these parlours from exchanging tokens for cash, this payout method is widely accepted, as pachinko machines are looked at as a traditional past time. By law the exchange centres and pawn establishments must be seperate from the parlour, but more often than not they’re directly connected to them. You may not be able to play pachinko for real money at the leading online casinos, but there are thousands of slot games to choose from if luck-based games are your jam. Head to Slots Million to enjoy the largest selection of slot games on the Web, with games available to play for free in practice mode or for real money bets.